Before view at seating arbor. An intimate seating area greets guests to this hidden garden. 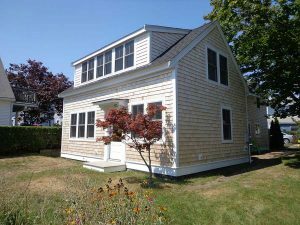 This newly renovated home sits mid-block in the scenic seade town of Provincetown. 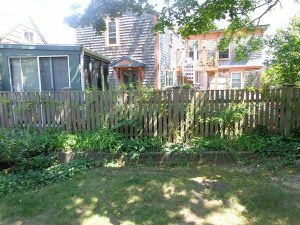 While a peaceful location, neighbors were visible on every side so privacy was a priority. The Owners frequently entertain outdoors so requested seating and dining areas. An entry arbor provides an intimate garden entry and separates it from the parking area. 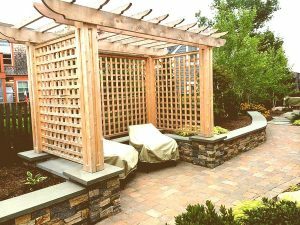 A larger arbor anchored by a stone wall provides a cozy seating area as well as a privacy screen. 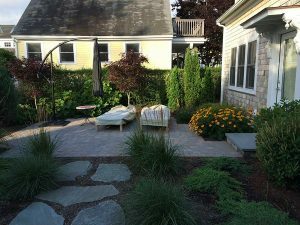 Stone walls provide impromptu seating and elevated planting beds. The seating area leads to dining terrace. Before garden- front of house.